The following is a guest post from Claudia Cruz and Alex Thackeray of ZipSprout. 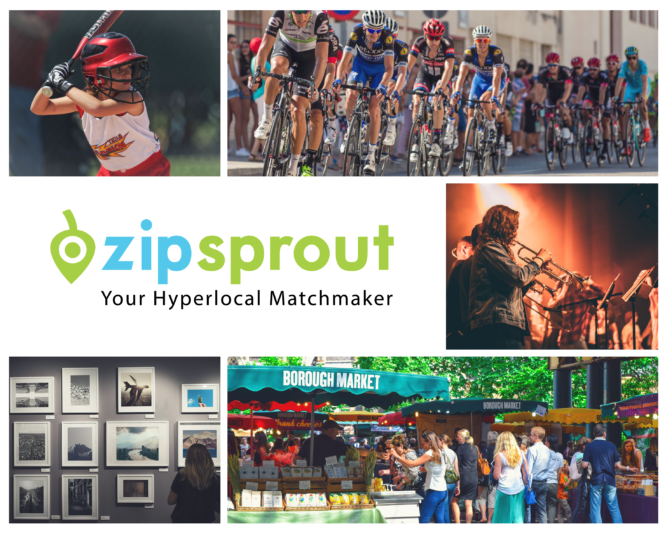 ZipSprout has been a sponsor of LocalU events and offer a platform to help match local businesses with local nonprofits, events and associations. Today they explain how they developed and use their Reach Score metric to best match local businesses with opportunities in their area. Brands, big and small, often question the quality, reach and influence of a sponsored organization’s website. Since 2015, ZipSprout has created campaigns focused on the nonprofit sector. In our work with local nonprofits, events, and associations, one of our biggest frustrations has been a lack of accurate measurement for local entities. We’ve used Moz’s Domain Authority, which provides an understanding of the quality and influence of an organization’s website. But there’s so much more to local influence than quality of a website from a search perspective. While we’ve encouraged others to use metrics like email newsletter size and social media followings, we realize these metrics are difficult to view in aggregate across various metro areas. We couldn’t let brands and fellow agencies launch a local sponsorship campaign without considering the compound data and reach a particular organization can provide, beyond a double-digit DA from their website. So we developed Reach Score. 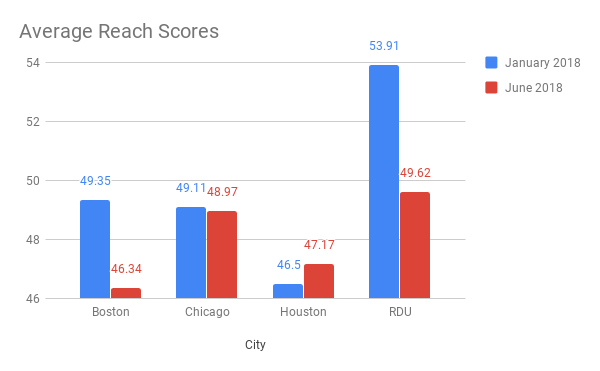 We launched Reach Score in January 2018 in four cities: Chicago, Houston, Boston, and the Raleigh-Durham area. Recently, we expanded Reach Score to four more cities – Seattle, Dallas, San Francisco, and Miami – and we expect to add more cities throughout the year. Since Reach Score is relative to all organizations within a region, each city needs a strong base of organizations before Reach Score is applicable. We want to avoid large changes in an organization’s Reach Score as we add organizations to our database and existing organizations improve their metrics. For example, adding a high-profile museum (with an outstanding DA and hundreds of thousands of social media followers) could cause Reach Scores to fall by 5-10 points if the number of comparison organizations is small – it’s like adding an NBA player to your community basketball league. This article discusses the methodology we used to develop Reach Score in greater detail, then examines trends we have seen in the six months since we launched Reach Score. We anticipated the need for Reach Score in early 2016, as we developed our internal sponsorship database. But at the time, we didn’t have enough data in our system to draw any definite conclusions on Reach, and other priorities took precedence. We re-ignited the conversation in mid-2017, after a massive branding project for a client in Chicago. After that project, we had a stable base for Chicago Reach Score. We selected three other cities and executed internal data collection efforts to create stability in our database for Reach Score. 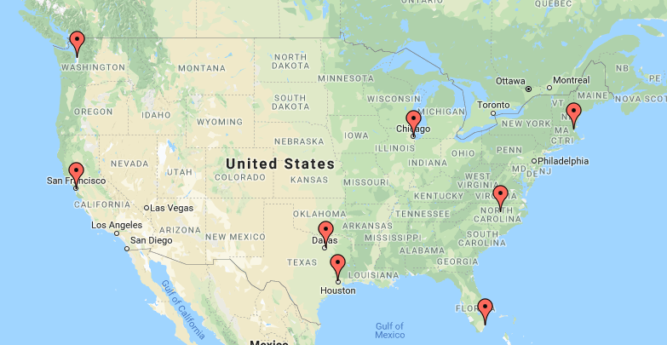 Raleigh-Durham was a natural choice as ZipSprout has been active there since inception, and we selected Houston and Boston based on existing data and the need for some geographic balance (the West Coast had to wait until the second wave). The Chicago project made it clear that Reach Score needed to be a local conversation; Chicago organizations shouldn’t be compared alongside Boston or Boise organizations. This was borne out as we analyzed data from our other cities – there are some organizations in Houston and Boston with more social media followers than the entire Raleigh-Durham area’s population. Any sort of national Reach Score would be biased towards larger cities (with larger populations), so we decided to keep it local. Although we normalized Reach Score to a 1-100 scale, it wasn’t enough to allow strong cross-city comparisons. In other words, a Reach Score of 70 in Chicago is different than a Reach Score of 70 in Raleigh-Durham – both organizations have a similar reach, or influence, within their region, but the underlying metrics are entirely different (the Chicago organization quantitatively “reaches” more people just because it is in a larger metro area). Since our focus is local, these cross-city comparisons do not fit our goals, but we may revisit the issue in a future revision of Reach Score. After seven months of gathering data, tweaking algorithms and reviewing Reach Score results, we were comfortable with the Reach Score algorithm, and we launched Reach Score on January 11, 2018. The key to developing Reach Score was to identify meaningful and available metrics that genuinely captured local influence, then balance those metrics to reflect actual influence in the local community. We looked at (and discarded) a number of candidate metrics, both publicly available and proprietary to ZipSprout, before settling on the three-to-six data points that broadly capture Web influence (Domain Authority), social influence (Social Media followers), and concrete local influence (events and newsletter subscribers). Once we identified the specific metrics, we experimented with how to combine them. Outliers presented a problem – for example, two out of 3,000 Chicago organizations have over 1 million Facebook followers, so Reach Score had to allow for those two very high social influencers without skewing all scores in Chicago or creating a huge gap in Reach Score between these two organizations and the other 2,998. We also worked through various weighting schemes to smooth out the results without unduly elevating (or punishing) organizations that had a very high score in one metric and very low scores in the others. Finally, we made Reach Score dynamic by making it relative to all organizations in a city. An organization can affect its Reach Score, and its Reach Score is affected by the actions of other organizations. This gives organizations some control over their Reach Score – it’s not an arbitrary, fixed number. But it also means organizations have to work to maintain their Reach Score, as other organizations improve their metrics. We struggled with normalizing the data to reflect the range of values for a given metric – some metrics were mapped to a statistical distribution to generate percentiles, while others were categorized into bins with fixed-point values. We checked our assumptions and algorithms over time as we added more organizations to our database – this helped us identify a threshold for launching Reach Score in a specific city, both in terms of the minimum number of organizations and the expected range of metric values for those organizations. The current algorithm blends our metrics with an information threshold for inclusion (organizations with only one or two metrics are excluded, as they would have artificially low Reach Scores). Reach Scores are relative, and are recalculated daily. Now that we have data over time for our first wave of cities, and a second wave of cities, we are looking at tweaks to the Reach Score algorithm to improve it as a measure and to make sure it reflects organization influence in the real world. While Reach Score won’t change as often as Google’s search algorithm, it is not a fixed score like the unemployment rate or other standard government statistics. The most significant trend in our four First Wave cities is an increase in the number of organizations. This is due to a variety of factors – the general growth of ZipSprout’s database, specific client projects, and organizations updating their information. That third factor ties in to Reach Score – as noted above, there is a minimum data threshold for Reach Score, so organizations often need to add their social media handles or other information to register and improve their Reach Score. While Reach Score is robust enough that one outlier organization (with an extremely high or low Reach Score) will not affect Reach Score for the other organizations in a city, adding a larger number of organizations will impact scores. Reach Score is designed to buffer these changes, but it assumes that the existing organizations are representative of the city. So, if the new organizations have a different trend (e.g., higher average Reach Score), that difference will be reflected in every Reach Score. As seen below, outside of Houston the trend is to add organizations with lower Reach Scores than those that were in the ZipSprout database in January 2018. There is also some general “settling” in Reach Score as the number of organizations in ZipSprout’s database gets closer to the number of organizations that exists in each city – the Reach Score algorithm is designed so that the average Reach Score of all organizations in a city is in the low to mid-50s. Since launch, the top organization types by average Reach Score have held reasonably steady. Many of the changes amount to a shuffling of position as more organizations are added. In a few cases, specific client projects resulted in new data that pushed an org type into the top three (e.g., RDU and Animal Shelters). In other cases, organizations adding data to the ZipSprout database improved their Reach Score (e.g., Local Government in Chicago). In addition to Reach Score, ZipSprout maintains proprietary data on the cost of a sponsorship. We considered including this as a factor in Reach Score but decided that cost is indirect to influence – few organizations price their sponsorships based on their local influence. That said, there is a general correlation between sponsorship cost and Reach Score – you pay more for a greater reach – but there are many exceptions. ZipSprout uses Reach Score and sponsorship cost as tools to design a campaign, but there are many other factors involved such as target audience, geographic scope, and our clients’ personal and professional preferences. Launching a local sponsorship campaign using Reach Score. For some local organizations, a smaller audience size correlates to a more targeted audience demographic. Local amateur sports teams typically have lower reach than other organizations (a score of 29.5, on average), but they reach particular audiences of local youth and their families. A middle school softball league may be a more tactical sponsorship choice for, say, a family dental practice, than a local beer and wine festival. The metric gives a snapshot of the local arena in a particular city. It shows what missions and causes are drawing a large population engagement. For example, Raleigh-Durham’s organizations with the highest reach tended to be government organizations, including Chambers of Commerce, and local parks. In Boston, we see more arts organizations, and even music ensembles garnering high reach. Start measuring Reach Score of any organization here. Are you ready to start your local sponsorship campaign? At ZipSprout we are strong advocates for everybody to become “local.” And we continuously work to provide resources that would help you have a thriving local sponsorship campaign. Get an invite to test our Beta version of the DIY Local Sponsorship Finder, coming this fall. Alex is an economist based in Denver, with over 10 years experience with data collection, management, and analysis for a wide range of government and private clients. For ZipSprout, Alex helps develop and explore our proprietary data on nonprofits and sponsorships.